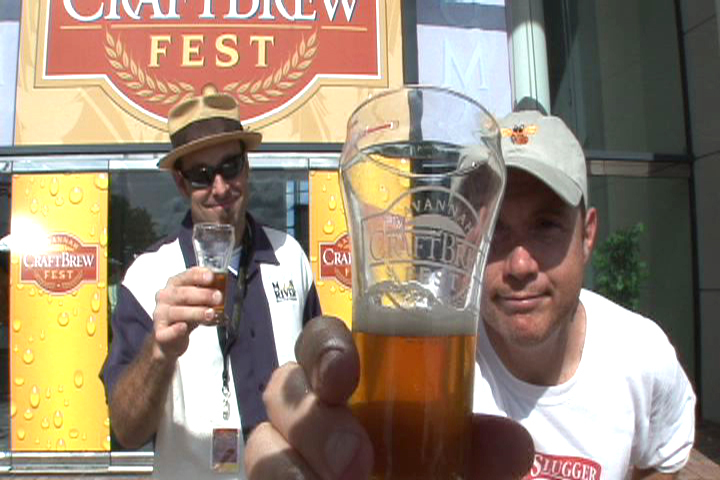 Welcome GABF'ers | Beer America TV - Craft Beer in Motion! I’m sure most of you reading this are new to BeerAmerica.TV, so I want to say welcome to Craft Beer In Motion! If you found this through your attendance at the Great American Beer Festival, I hope you have fun and say hello to our friends Sam Calagione from Dogfish Head, Garrett Oliver from Brooklyn Brewery (who we’ll be featuring soon on our site) Julia Herz form the Brewers Association, and most of all, my vlogging partner John Pinkerton of Moon River Brewing. My goal here is to bring the amazing world of American Craft Beer to a 21st century level. I plan on doing this by traveling the country telling American Craft beer stories, introducing you the most innovative brewmasters in the world, and vlogging about as many American Craft beers as I can find! This is THE SITE for experts and inside information from the folks that are actually brewing the beer we all love. As a TV producer by day, telling compelling stories is something that comes naturally to me, so I decided to take that love, and combine it with another, and BeerAmerica.TV was born. We have a ton of plans ahead, and with a little help from future sponsors, we plan to bring you weekly webisodes of BeerAmerica.TV with a nationally recognized host. Web video is the wave of the future and BeerAmerica.TV is on the ground floor for promoting American Craft Beer – so hop on board and enjoy the ride. Don’t believe me? I have one word for you – VAYNERCHUK!